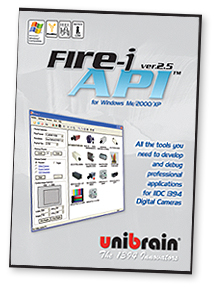 Fire-i API is a complete SDK for developing and debugging professional applications for 1394 IIDC Digital Cameras. Complete Open Source C++ class for full camera control. DirectShow based drivers, WIA compatible in Windows Me/XP. Full set of functions for display and storage of frames, live video and TCP streaming. Support for YUV, RGB, Y-8 and Y-16. Support of any format including user-defined (Format_7). Multilanguage support via open source .net Wrapper. Generic driver for all IIDC 1.31 compliant models. 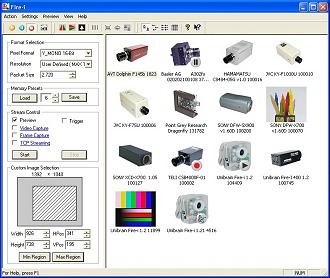 Driver support for all 1394b (Firewire-800) IIDC cameras. Specific drivers for models of Unibrain, Sony, AVT, Basler, Hamamatsu, JVC, PointGrey, Pixelink, Toshiba. Fire-iAPI™ Header and Lib files. Great variety of source samples and extensive documentation. Three months free development support. Software activation runtime license for all Unibrain SDKs (FireAPI, Fire-i API) and Fire-i application. The license activates the drivers per firewire adapter or firewire IIDC camera (customer choice). The GUID (Globally Unique Identifier) of the device must be provided to Unibrain and then we will return to the customer the activation code. The device GUID can be obtained from Fire-i or FireAPI authorize utilities, as described here: Unibrain SDKs and licensing information. After your online order is confirmed, please email us the online receipt at Customer Service Email, along with the GUID(s) of your devices, and we will email you the activation code(s).